Chick-Fil-A is highly regarded as the best fast food franchise in the nation, and with the customer service its employees display on a regular basis throughout the nation, there’s no question as to why. This time, the latest good news from the fried chicken restaurant came in the form of a viral video showing an employee holding an umbrella for customers who needed to walk their cars in the rain last week on a stormy summer day in El Paso, Texas. To make matters even more endearing, the children he was filmed shielding from the rain weren’t the only ones the Chick-Fil-A hospitality director helped during heavy downpour, Fox News reported. 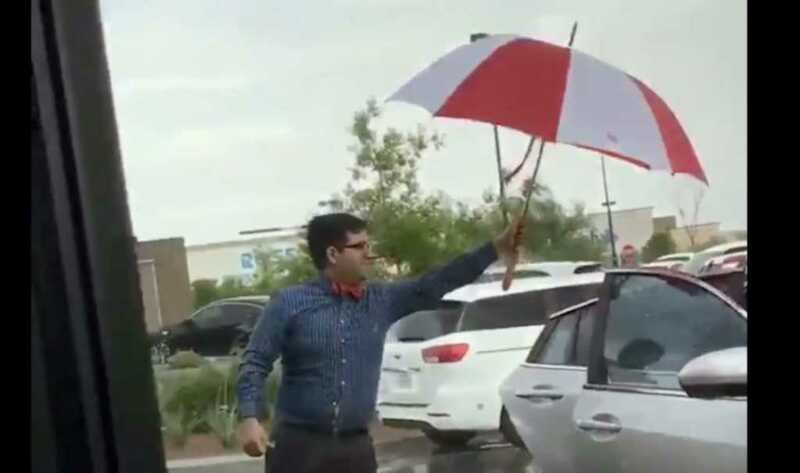 Matthew Nunez was seen running around the parking lot from customer to customer, his trusty oversized umbrella in hand to ensure they stayed as dry as possible. High school student Mark Ramos, who was dining inside the restaurant at the time, recorded Nunez’s acts of kindness. The video has been viewed on Twitter more than 2 million times since it was posted on July 12. “Chick-fil-A, hands down, best service,” Ramos wrote. Nunez responded to Ramos on Twitter, thanking him for capturing the moment. “It was an encouragement I very much needed,” he wrote, concluding the tweet with a Bible verse. Nunez told KFOX-TV that he was “still shocked” over the attention the video garnered. However, it was bound to happen eventually. Ramos told the station that he has witnessed Nunez’s exemplary customer service on past occasions. “It’s my pleasure to serve,” Nunez said.